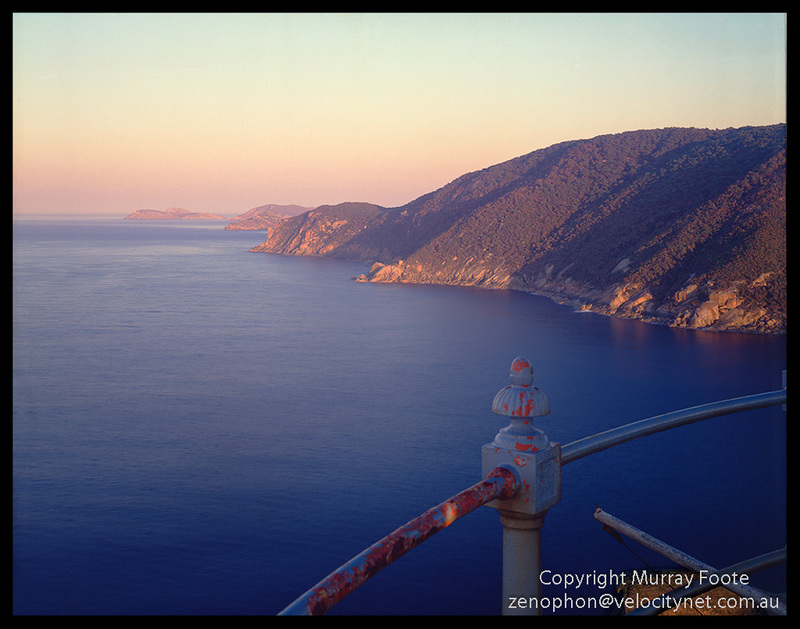 Wilson’s Promontory, commonly called Wilson’s Prom, is the southernmost point of the Australian mainland. 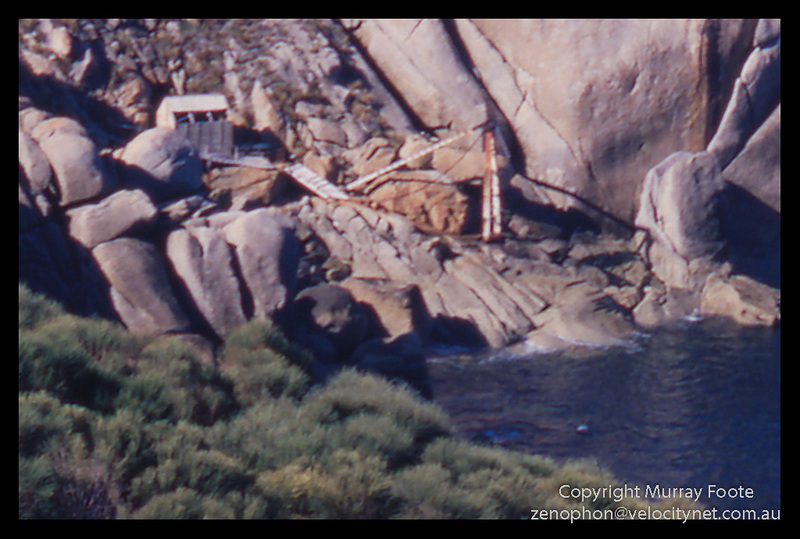 I visited the lighthouse there on 24th and 25th April 1987. As an official visitor, I was able to drive as far as the end of the road, well past the point where most people have to walk. It was just before sunset when I got there and this is the view from where I parked the car. As you can see, there is still a fair distance to walk. 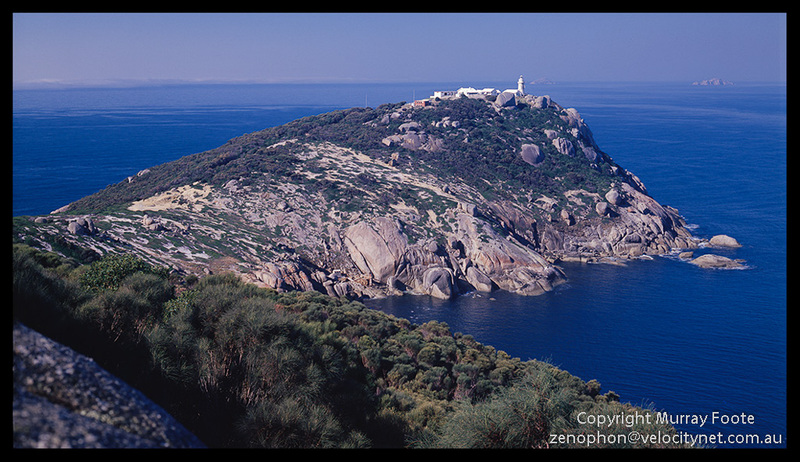 Building of the lighthouse was recommended in 1853 and construction commenced in 1857 using convict labour and locally sourced granite. It was lit for the first time in 1859. It is just under 20 metres high and sits nearly 120 metres above sea level. 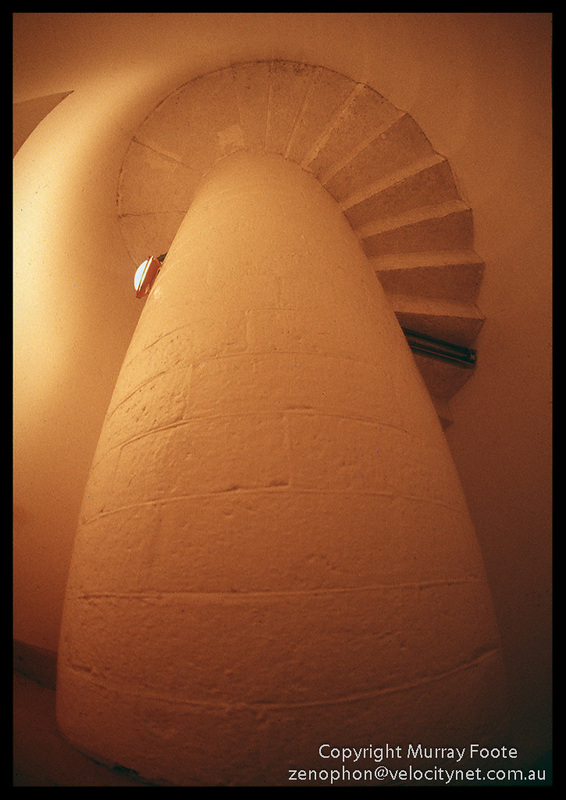 This is the lighthouse staircase seen from below at 8 o’clock at night. There are two possible explanations here: either the tower was bending over in a heavy wind or I was using a fisheye lens. I’ll leave you to work out which it is. View along road at Wilson’s Prom. Here is the lighthouse and cottages just after dawn. 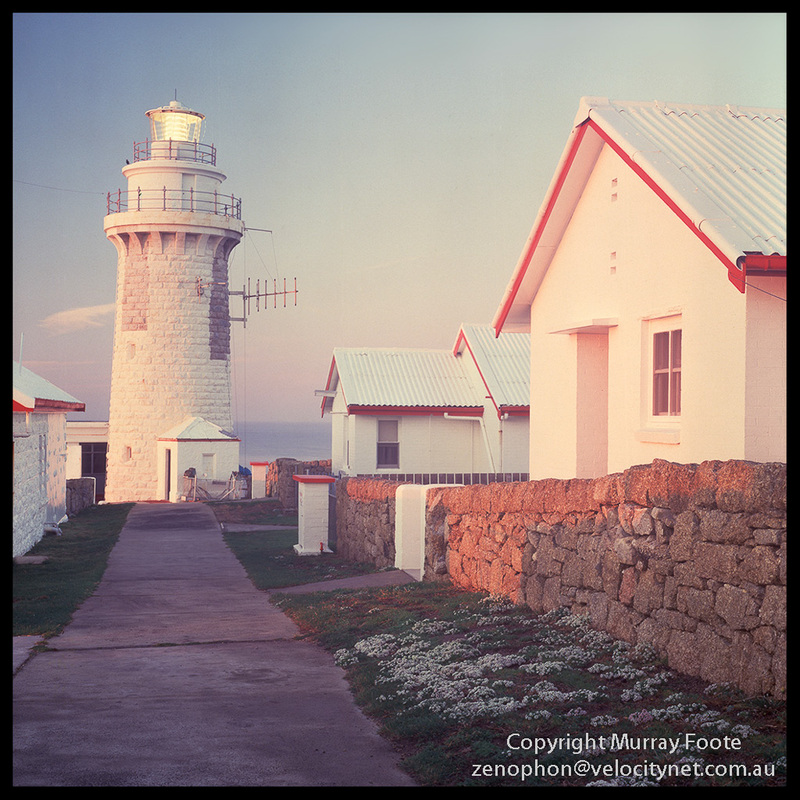 There is a delightful little village atmosphere around the lighthouse. Two of the four houses were burnt in a bushfire in the early 1950s and rebuilt. Originally the lighthouse was painted white but if you visit it now it is unpainted, having been stripped back to the rock. This process had just started at the time of this picture. This is one of the lighthouses where you can now stay at a cottage though you have to walk 18km to get there. After taking the previous shot of the lighthouses and cottages, I climbed to the top of the lighthouse and took this one looking along the coast to the west. Here is a view of the lighthouse that I took when I was walking out. The islands in the distance (behind and to the right of the lighthouse) must be East Moncoeur and West Moncoeur Islands. … as you see here. 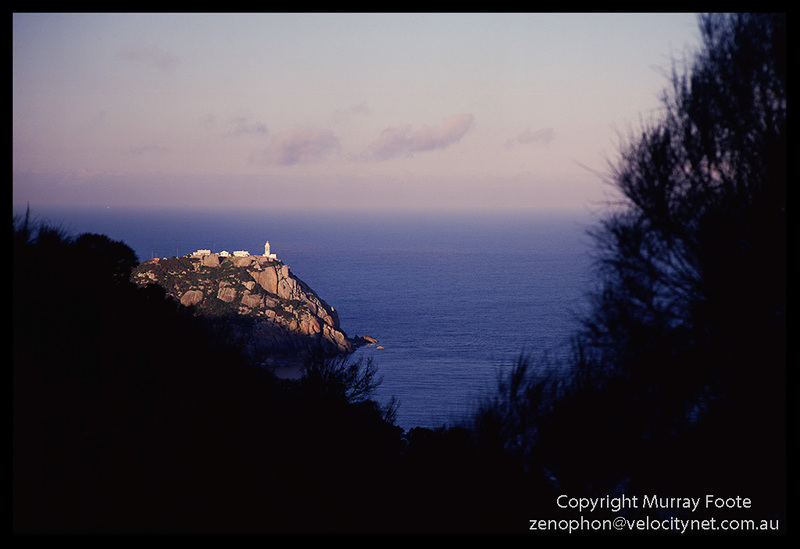 This entry was posted in Australia, From Dusk Till Dawn and tagged Architecture, Australia, History, Landscape, Lighthouses, Photography, seascape, Travel, Victoria, Wilson's Prom, Wilson's Promontory.